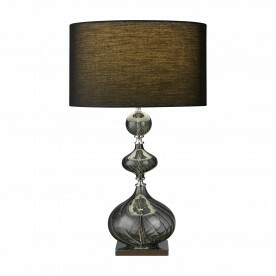 This textured table lamp features 3 different sized baubles. They use a ribbed effect to create a stylish finish but are smooth to touch. Using chrome to divide the baubles, and also on the base, adds a classic feel to the lamp which is accompanied by a simplistic black shade. Place on a bedside table and bring light to your bedroom.